Has there ever been a moment in your life in which you’ve seen something and your thought has been, “This is it … I’m about to die.” Perhaps you’ve been out hiking and you’ve seen some form of wildlife. Maybe it’s been when you stood on the edge of a massive cliff (I felt this way when I went to the Grand Canyon). If you’re like Jess, it’s probably been when you’ve seen a spider. But I don’t think anything could really prepare you for a real life confrontation with today’s aircraft: the Boeing AH-64 Apache helicopter. Think of the Cheyenne as the Apache’s older, fatter brother that ended up being a major disappointment, dropping out of college after the first month. When hope in the family business was lost with Big Brother Cheyenne, the parents turned to Boeing to save the day with brother Apache. In 1966, the United States Army was in the market for a jet-assisted attack helicopter that, as a secondary goal beyond defensive escorts, could also dash ahead (up to 244mph) for an offensive front. Lockheed’s AH-56 was meant to be that helicopter. Unfortunately, after exceeding the budget, the weight, procuring too many technical difficulties for the Army’s taste, and more than one fatality during test flights, the Army cancelled their contract with Lockheed. Ten Cheyenne helicopters were completed during production—only four survived testing, three of which are on display at various museums. Unfortunately, the Army still needed a jet-assisted helicopter for armored air transportation. Solutions had been found to many of the technical difficulties the Cheyenne had experienced, but the program was already so over budget that Lockheed was not given the chance to embrace the fixes themselves. 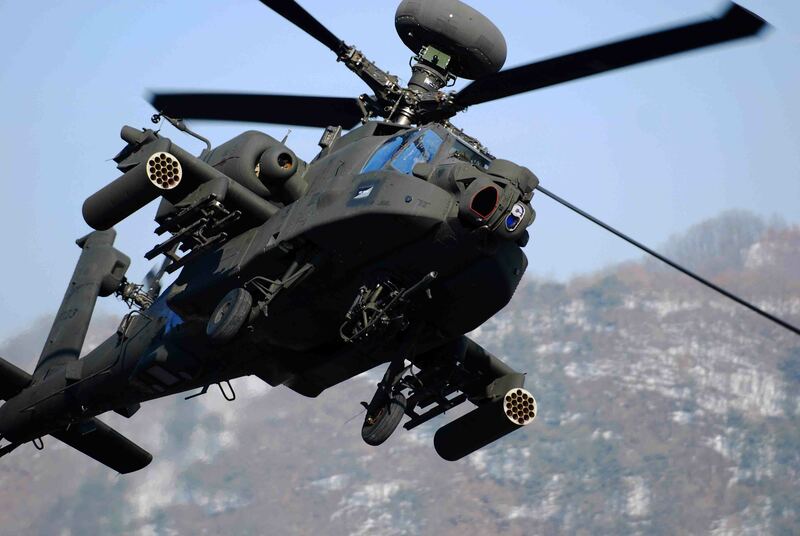 In a new bid, Boeing won production rights to a dual-engine attack helicopter; the dual engines resolved most of the stability issues the Cheyenne had. A more compact design (due partially in part to the dual engines) led to a lighter aircraft, which fulfilled the Army’s maximum weight requirements. What the Army really wanted was an aircraft like British Aerospace’s Harrier Jump Jet. Unfortunately, the Key West Agreement denies the Army the rights to own or produce its own fixed-wing aircraft. This may seem like a strange policy for a division of the Department of Defense to agree to, but it essentially separates the various types of aircraft owned by each division of the United States Military. The Air Force controls most of the fixed-wing aircraft, the National Guard and the Army own primarily helicopters, etc; it helps maintain division of roles. Anyway, their solution to a Harrier-like aircraft without mounting wings was a jet-assisted helicopter. In 1976, four years after the Cheyenne program was cancelled, the concept for the AH-64 was approved. Two more units were produced, surpassing the Army’s desires for the aircraft, and in 1982, the AH-64 was approved for full production. The initial production model was known as the AH-64A, a unit that cost $20 million to produce. In March of 1997, an upgraded version of the AH-64 was developed and called the AH-64D. This model featured improved sensory systems and enemy detection, superior armor plating, and a safer glass cockpit. With the improved sensory systems on the AH-64D comes the dome you see on the very top of some of the aircraft. This dome features advanced targeting technology and radar for targeting. The dome is elevated so far above the rest of the aircraft so the aircraft can be hiding behind a hill, but the radar targeting system can still lock onto an enemy and fire. 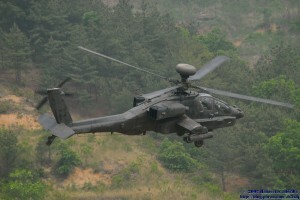 The unit cost of an AH-64D Apache today is about $18 million. At this time, nearly all AH-64As in existence have been upgraded to AH-64Ds. To this day, over 1,100 Apache attack helicopters have been developed and are used in action. 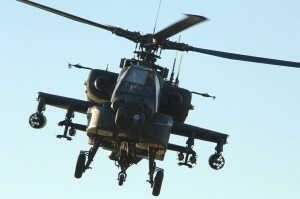 One cost the AH-64 Apache did not incur that the Cheyenne did was fatalities in testing. From the beginning, the Apache helicopter was always a much more stable and controlled design. You’ll know when you see the AH-64 Apache. Most likely because you’ll suddenly find that your pants have been soiled and your legs are shaking involuntarily. Don’t believe me? 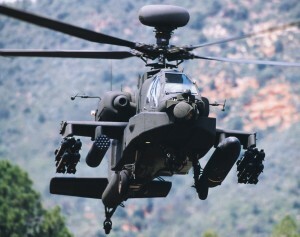 After the AH-64As huge success in non-confrontational combat, the AH-64D was developed with a primary goal of taking advantage of the Apache’s terrifying facade and making it that much more so. During the Gulf War, only five years after the public release of the new attack helicopter, three Apache helicopters were deployed on a particular mission to help eradicate Iraqi troops. The moment the Apache helicopters arrived, as they rose over the horizon and came into the enemy troops’ vision, 10,000 Iraqi troops threw down their weapons, fell to their knees, and lifted their arms in surrender; the helicopters never fired a single shot. Since only two crew members reside in each Apache helicopter, that means six soldiers successfully overthrew 10,000 hostile troops. Other ways to identify it are by its unusual length for a helicopter—or the fact that it’s a helicopter with twin jet engines, one mounted on either side. The Apache measures 58 feet in length, 16 feet in height, and has a 17 ft. “wing” span. The diameter of the rotors is 48 feet, making the rotor disc area 1,809 sq. ft. 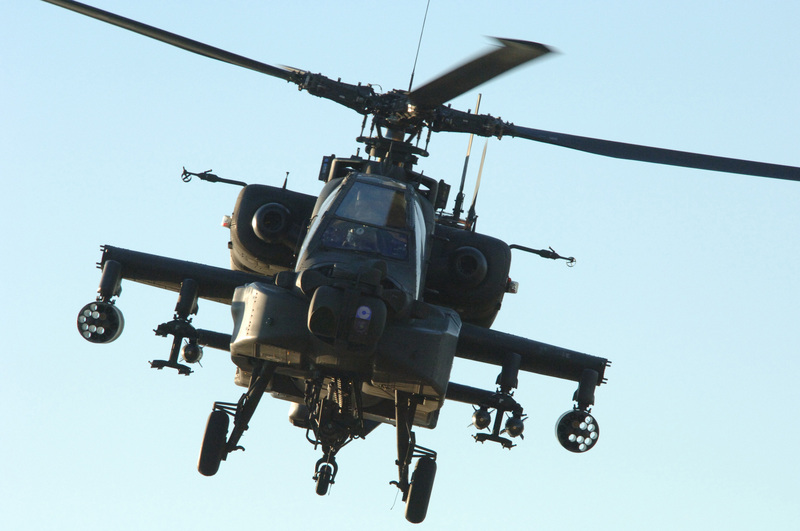 When loaded with an average capacity, the Apache weighs a little over 15,000 pounds. They can have up to two fuel tanks—one internal, one external— totaling over 8,000 pounds of fuel on takeoff. 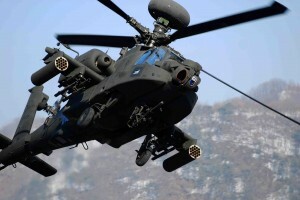 However, if the AH-64 is on a short-range attack mission, the external fuel tank can be swapped out for 16 Hellfire air-to-surface missiles or 76 70 mm rocket pods. Which reminds me, an attack helicopter wouldn’t be very complete without its armaments. 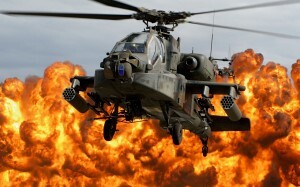 Boeing’s AH-64 is always equipped with one 30 mm chain cannon, which may host up to 1,200 rounds. Though this helicopter has no bombing capabilities, it can have any combination of the following air-to-surface missiles: AGM-114 Hellfire, AGM-122 Sidearm, or BGM-71 TOW. If an Apache confronts you, it may also be loaded with AIM-9 Sidewinder or AIM-92 Stinger air-to-air heat-seeking missiles. Finally, the AH-64 Apache can also carry 70 mm rocket pods, as mentioned above, as well as 127 mm rockets. Other than seeing an Apache attack helicopter at an air show, you may have seen a few make an appearance in the movie Fire Birds, a 1990 film starring Nicolas Cage as an Apache pilot. Transformers fan? The “Spinster” Transformer character morphs into an Apache attack helicopter. The AH-64 also makes appearances in the 1991 movie Toy Soldiers.